If you’ve been waiting for the best moment to buy a new laptop, this may be it. Today, Apple announced its powerful, ultra-lightweight MacBook Air line is getting a number of technological upgrades and speed boosts, dramatically improving the computer’s performance without increasing the price. The new MacBook Air uses super-fast flash memory to store your documents and keep your computer from getting bogged down by basic data access tasks. Advances in the technology allow this model’s flash storage to clock in 45% faster than last year’s models. And, you get more of it than ever before: The 11-inch model comes with 128GB of flash storage standard, with options to increase memory all the way up to 512GB. Not only is your computer getting faster, but your Internet might be getting faster too. The new MacBook Air supports the 802.11ac wireless standard, which offers three times the connectivity speeds of 802.11n when paired with a compatible router like the new AirPort Extreme. Great as both these speed boosts are, the most impressive innovation found in the updated MacBook Air is its improved battery life. The laptop’s use of Intel's next-generation line of Haswell processors and improvements in energy efficiency across the device have given the Air “all-day battery life,” with the 11-inch model offering 9 hours worth of use on a single charge. And if that’s not impressive enough, the 13-inch Air can last a full 12 hours. 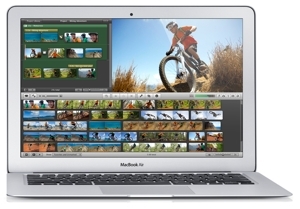 The 11-inch MacBook Air still starts at $999; the 13-inch Air starts at $1,199. Both models are available for order today on Apple.com. The upgraded laptops will go on sale at Apple retail locations on Wednesday, June 12, 2013.